Opus 88, from Taiwan, are a relative newcomer to the international fountain pen scene. They have released some novel and eye-catching designs starting with the Koloro series of pens, a uniquely designed pen with resin and ebonite finish, this more traditional Picnic series, and more recently the striking Fantasia series. The Opus 88 Picnic Brown is a traditional cigar shaped resin pen with rounded ends. The ends are smoother than the pointier ends of Montblanc’s 146 and Sailor’s 1911 pens and even smoother than the Platinum Century #3776. There is a subtle taper on the barrel but it only really starts to taper from the piston knob. The pen has a silver trim and underneath the twist-cap there is a stainless steel JoWo #5 nib. The packing starts off with a simple off-white cardboard sleeve with the Opus 88 symbol and “OPUS 88 Fine Writing Instruments” debossed into it. When slipped off, underneath is a black faux-leather (in style only; they are not trying to pass it off as leather) coffin box with a sticker on the side identifying the pen model and type. Inside the box is small filling manual, a soft mould that encases the pen and the included pipette. The pen is a yellow-brown colour. It’s not a saturated brown but it isn’t dull either. The darkness of colour changes depending on the ambient light: low and the pen is quite dark; bright and the yellow-brown colour shines. The brown colour of the cap finial and the piston knob is darker because the resin is thicker. The colour is meant to resemble coffee and it does a decent job or resembling light passing through a black coffee. The step down, before threads, on the barrel of the pen is a little sharp; not overly but certainly not soft; the threads them selves aren’t sharp. The plastic resin of the pen is a hard plastic and the finish is smooth and glossy. The cap takes over two and a half turns to remove. Personally, I find this a little too much as it feels a little slow when I want to take a note quick. The clip is a simple and somewhat generic design with a dash pattern on the edges and a folded metal ball at the end. The clip does rotate around the pen but this isn’t too much of an issue as the as the resin pressing against the clip ring does keep it tight and it takes some force to move it. This does mean that you can make sure the clip aligns with the “OPUS 88” written on the bottom of the cap. The filling mechanism is a hybrid between a vacumatic and an eye dropper. When I say it’s a hybrid, that is a little flippant. The pen is an eye dropper filler but it has a piston in it that blocks the reservoir from allowing ink flow into the feed section. This same utility is present in many vacumatic pens including some Viscontis (but not all), TWSBI Vacumatics and the Pilot Custom 823. The piston in these vacumatics also functions as a the filling mechanism, however, and with the Opus 88 Picnic the piston is only to block flow. The benefit of blocking flow from the reservoir into the feed is to assist with preventing burping and leaking of the ink, an issue that eye dropper pens are somewhat susceptible to. It also has a secondary benefit when flying; pens on a flight have a higher propensity to leak into the cap and this prevents that. To fill the pen you first uncap the pen, then you unscrew the section from the barrel, unscrew the piston and then pull (not twist) to extend it fully. Then you use the provided pipette to take ink from a bottle and deposit into the the barrel, screw the section back on and push the piston down (don’t worry this won’t force ink out) but don’t screw it closed. The nib won’t be primed yet so it might take a small amount of time for ink to make it’s way down (it was surprisingly quick for me). Once the pen is writing you can screw the piston closed. If the pen starts to write dry due to the piston being down preventing ink flow from the barrel, opening the piston will refill the section. This might seem like a lot of work but it does offer a large 2.2ml capacity and is much easier to clean than a vacumatic. 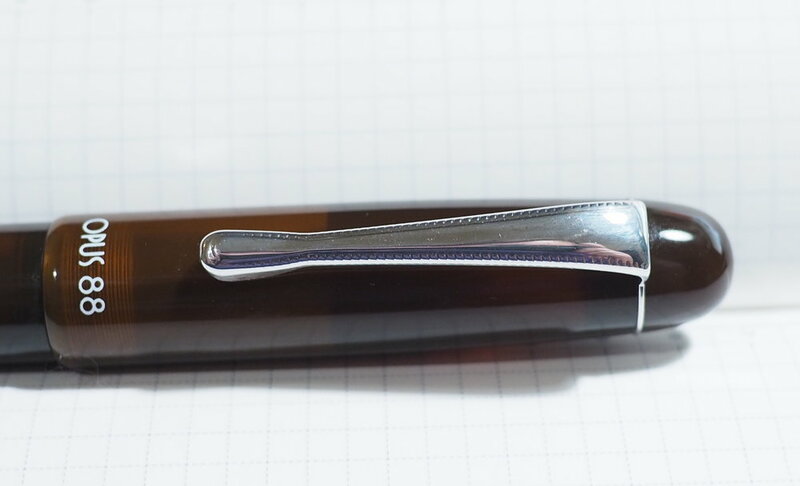 The nib on the Opus 88 Picnic is a stock #5 stainless steel JoWo nib; this one is a fine. The nib has “OPUS 88” and the typical JoWo filigree. I often adjust nibs I receive but I didn’t do that with this pen. In my experience JoWo nibs are generally consistent with most not being misaligned or having baby’s bottoms etc. I have still adjusted JoWo nibs in the past, mostly to make them smoother or have wetter flow, but most of these have been personal preference. This nib is definitely not wet but it’s not so dry that I have needed to adjust it. The nib size compares fairly similarly to other fine nibs I have. The Opus 88 Koloro and the TWSBI Vac Mini also feature a stainless steel #5 JoWo nib and perform with a similar line width. The Pelikan EF is appropriately thinner and the Visconti is unsurprisingly fatter. The Sailor Pro Gear F is filled with a wet Noodlers ink which is making the line noticeably thicker than usual. The Franklin-Christoph has a Masuyama Needlepoint which I have made a touch wetter (which makes the line a touch fatter) it is noticeably thinner. I consider this a midsize pen at 14.3cm/5.63”. The pen doesn’t feel large in the hand and the diameter certainly isn’t large. The pen is on the lighter side being noticeably lighter than a Montblanc and Lamy 2000 but is still slightly heavier than a TWSBI Eco or Lamy Safari. I don’t find the diameter of the grip section too thin. Left to right: Lamy 2000, TWSBI Eco, Pelikan M805, Lamy Al-Star, Opus 88 Koloro, Opus 88 Picnic, Montblanc 146, Platinum Century #3776, Visconti Homo Sapiens, and Sailor Pro Gear. Capped the Opus 88 Picnic actually exceeds the Montblanc 146 and Pelikan M805 in length and is close to the large Visconti Homo Sapiens. Uncapped the pen is almost identical to the Opus 88 Koloro, Lamy 2000 and Montblanc 146 but now comes up much shorter than the TWSBI Eco, Pelikan M805 and especially the Visconti Homo Sapiens. When I recently spent two weeks traveling in Japan this was my go-to pen for writing things down. The fact that it takes so long to unscrew the cap was slightly annoying but definitely not a dealbreaker. The pen was always ready to be used and even if it started to run down when the piston wasn’t unscrewed it was quick to get flow back. The pen was durable and I didn’t feel like I needed to cradle the pen, I kept in in a pants pen-pocket and there was no leaking and no worries. Pen Classics NZ has the pen for NZ$135 (US$90 and AU$124) - which is cheaper than other prices I’ve seen - so the pen isn’t the cheapest pen out there but none of Opus 88’s pens are cheap pens (in price or quality!). These are well made and well designed pens and for me the price is perfectly acceptable. I got brown because I like coffee themed pens and the brown of this pen is meant to resemble coffee but there are certainly some more vibrant colours available. Thanks again to Pen Classics NZ for sending the pen for review. I received this pen free of charge for the purpose of giving an honest review. I was not otherwise compensated and everything here is my own honest opinion. There are no affiliate links.